Door knob from the reportedly haunted (and now demolished) Reid Hall on the Miami University campus in Oxford, Ohio. As if I needed any additional proof that my marriage to Steph was meant to be, consider this little paranormal fact: Steph and her entire family have lived for many years in Oxford, Ohio. In fact, her parents still call Oxford home. Why is this such a big deal? Well, Oxford, Ohio, is also home to one of my favorite ghostly legends, the Oxford Motorcycle Ghost. And at one point, a building with a spooky and bloody past used to stand a short drive (or a brisk walk by my father-in-law, Steve) from the Flee family homestead. That building? Reid Hall on the campus of Miami University. Reid Hall’s bloody past began on the evening of May 9th, 1959, when RA Roger Sayles attempted to break up a fight inside the building. First-hand accounts of the event are sketchy, but at some point, one of the assailants drew a gun and shot Sayles. The shooter fled to Ogden Hall and subsequently committed suicide with the same gun he used to shoot Sayles. As for Sayles, he eventually succumbed to his wounds and did not survive the night. But not before, according to legend, falling against one of the dorm room doors, leaving behind two bloody handprints. Handprints that were supposed to have remained visible on the door despite numerous attempts to scrub them away. In addition, strange activity involving ghostly footsteps and doors opening and closing on their own were reported shortly after Sayles death. This activity was said to be being caused by Sayles’ ghost. Reports continued until Reid Hall was slated for demolition and students were moved out of the building beginning in 2006. Prior to Reid Hall being fully demolished in 2007, The Ghosts of Ohio was granted a unique opportunity to investigate the building. Parts of Reid Hall had already begun being ripped out and hauled off, so we were all required to sign waivers and don hard hats. But in we went! Sadly, when we arrived, we found that most of the internal doors had already been removed, including the one that was said to have the infamous handprints. We did find a stack of doors down in the lobby, but the “handprint” one was not among them. Perhaps that’s why we didn’t experience anything weird during the investigation or on any of our audio and video recording devices. Maybe Sayles’ ghost followed his bloody handprints out of Reid Hall, never to return. 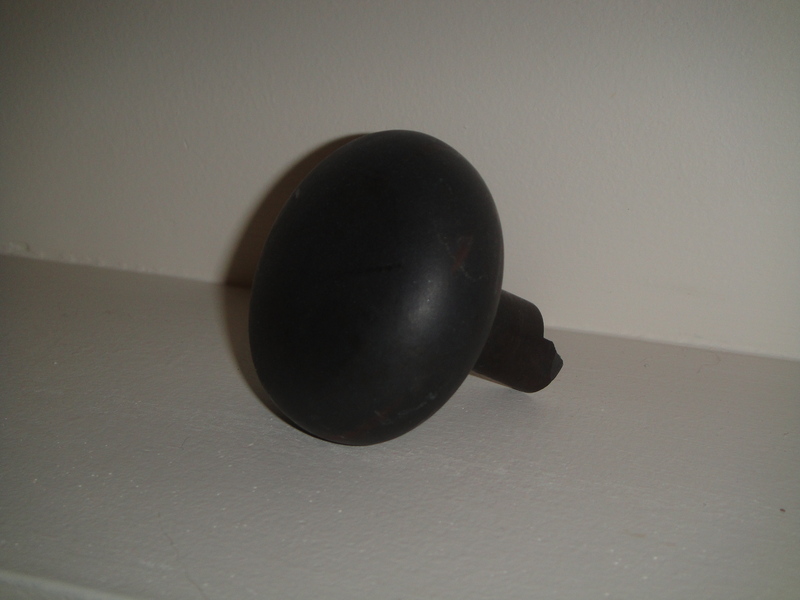 As for this doorknob, it was given to me as a memento of our investigation at Reid Hall, which to my knowledge, was the first and only official one ever done at the building. No way of telling whether it came from the “bloody handprints” door or not. But judging by the number of doors in Reid Hall, I’d say the chances of it being from that door are pretty slim. Well, that and the fact that I’ve yet to have mysterious bloody handprints appear on any of the doors of my house…yet. I lived in Reid Hall in the 1982-83 school year (in 2 south). I could never find out which specific door the hand prints were supposedly on. Nor did anything strange happen with the exception of an irate undergrad setting fire to the head res’ door. I think that’s one of the big mysteries surrounding Reid: where the door with the handprints was! I’ve talked to various people over the years who have placed in on various floors on both sides of the building. To date, I’ve never been able to confirm that those prints ever existed! Maybe one day, someone will provide me with a photo. Until then, I’ll keep searching!